Helge Tømmervåg aka Mind over MIDI er straks klar med sitt tredje album Project 3 som slippes i juni. Han fortsetter stilen fra ICE Acoustik, dvs mørk arktisk ambient blandet med berlin-minimalisme. Men denne gangen introduseres et nytt element, de fleste av sporene på albumet har vokal fra ulike gjeste-vokalister: Sidsel Endresen, Anneli Drecker, Stein Bjercke, Hilde Drange og Oddman. I tillegg bidrar Nils Petter Molvær og Bugge Wesseltoft. Første smakebit fra dette albumet er 10"-eren Walkman, med eksklusive dansegulv-versjoner av Walkman og Shadow. Oddman står for vokalen på a-siden, mens Anneli Drecker bidrar på b-siden, med lånte vokal-elementer fra Bel Canto's Unicorn. Helge Tømmervåg aka Mind over MIDI is soon due with his awaited third album Project 3 (to be released in June in Norway, early autumn rest of the world). He continues with the style from ICE Acoustik; dark arctic ambient mixed with Berlin-minimalism. But this time a new element is introduced, most of the tracks have vocal contributions from various guest-vocalists: Norwegian jazz-singer Sidsel Endresen, Anneli Drecker from Bel Canto, Stein Bjercke from indie-rock band Lorenzo, Hilde Drange from Slowpho and Oddman who also participated on one track on ICE Acoustik. Other Norwegian jazz musicians contributing are the Nils Petter Molvær (trumpet) and Bugge Wesseltoft (piano). The first taster from this album is the 10" Walkman, with exclusive dancefloor-versions of Walkman and Shadow. 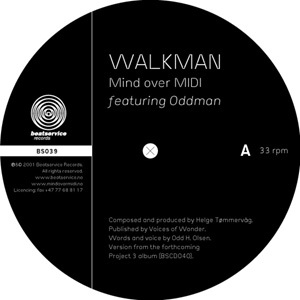 Oddman sings on the a-side track, while Anneli Drecker contributes on the b-side, with sampled vocal elements from Bel Canto's Unicorn.